It seems almost natural at the beginning of the year to create a fresh start to the new year. Part of that fresh start is to set new goals for the year. This goal setting practice for the new year is commonly disguised as new years resolutions. A resolution is a firm decision to do or not do something. The root word of resolution is resolve. The original connotation of the word resolve is that something is settled. So, in making a resolution, the matter is settled that you are going to do or not do something. However, the statistics around New Year’s resolutions is most people don’t follow through on their resolve. “When it comes to setting New Year’s resolutions, most people shoot for the moon. We tell ourselves that this will be the year we’ll give up carbs, go running every morning, become a vegan or quit drinking. Inevitably, three weeks later, we find ourselves right back where we started. What gives? Here are 5 things to help you achieve your goals for 2018. Break big goals down into smaller ones. Goals that require many steps to complete may seem to be overwhelming to even start, must lest complete. Breaking big goals into smaller ones allow you to take incremental steps that lead to the accomplishment of a big goal. For example, let’s say you have a goal to lose 40 pounds this year. This is a good goal if you are that overweight and will improve the quality of your life. Okay I know that was a sidebar comment. An approach to breaking this goal into smaller ones is to have a goal for each month or week. You could say 40 pounds divided by 12 months means I have to lose about 3.5 pounds per month. Doesn’t losing 40 pounds sound more doable at 3.5 pounds per month? You can take this same approach to all of your big goals. Keeping a journal allows you to measure your progress. Now it goes without saying, but I must say it, you have to be honest in keeping your journal. If you fail to do today what you said you would do, write it down and ask yourself, what you can put in tomorrow that is going to make a difference in you being successful? Developing this type of observation about yourself will pay huge dividends in all areas of your life. I’m not going to be late for appointments, to…I’m going to arrive 10 minutes before each appointment. I’m not going to lay in bed after the alarm rings, to… I’m going to get out of bed when the alarm rings. I’m not going to drive over the speed limit, to… I’m going to drive within the speed limit. When you put things in the action language, you can take the appropriate action to accomplish your goals. Make your goals results oriented. There are two types of goals to be aware of. They are, results goals, and action goals. Results goals are what is the goal or outcome of actions taken. Results can be objective or subjective. The key is, whether the goal is objective or subjective, the goal is measurable. To lose 40 pounds this year is a result goal. It is objective. By the same token, you could have a result goal to have significant improvement in your cardio vascular endurance. While this may not be objective, you can measure your progress. Activity goals lead to a result. Using the lose 40 pounds goal, could include the activity goal of working out 5 times each week. The activity of working out 5 times each week, leads to achieving the result goal of losing 40 pounds. Set becoming goals. Becoming goals are goals around who you will be. For example, you could have a goal to become an effective communicator. The goal then, is to have you be an effective communicator. Consider that becoming goals support you in achieving the results you want to achieve. You cannot do before you be. When my boys were growing up, (my oldest is almost 30 and my youngest just turned 27). Before they left the house I would always tell them to be careful. I did not tell them to do careful things. If they were being careful, or careful is who they be, they would be doing things that careful people do. The same concept is true for achieving your goals this year. Who do you have to be to do the actions that bring the results you want? The matter is now settled. You now are resolved to achieving your goals for this year, or whenever you are reading this blog post. Your resolution to achieve your goals is directly correlated to you implementing the 4 strategies above. Go do it. 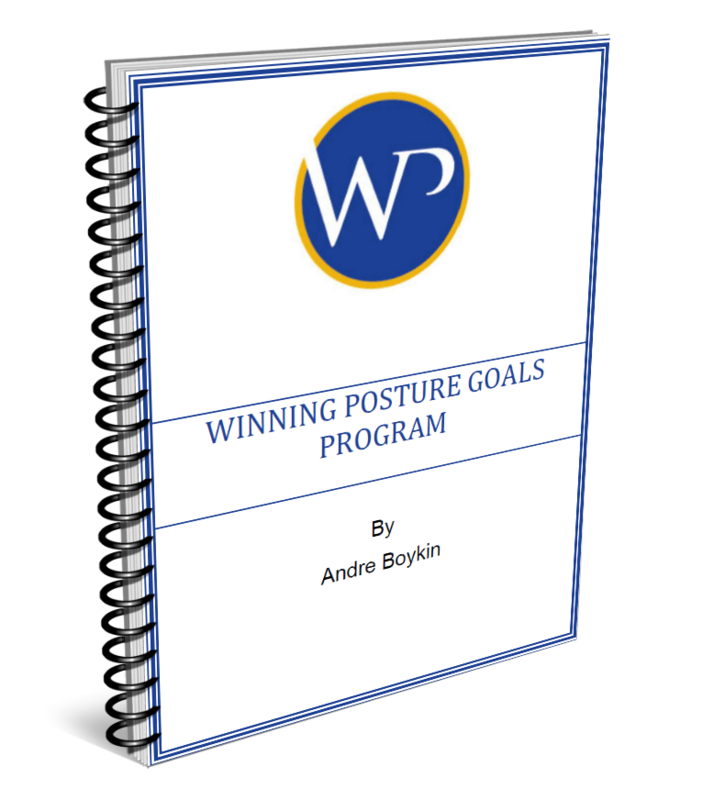 You, have Winning Posture which is, the mindset, of achievement.